From the vantage point of our residence on Crescent Lake we can observe the spring arrival of geese on their migration north. We have always watched with interest and amusement the raising of families of geese – usually one or two families per season each consisting of two parents and usually 4 to 6 goslings. As summer comes along they become more organized into groups as they move around the lake training to “follow the leader” in straight and evenly spaced lines in preparation for their fall migration south. This spring we observed a pair of geese with more than twenty goslings, some of which were obviously hatched prior to others. This is referred to in the literature as, “adoption, creche or mixed brood, gang-brooding and kidnapping” which isn’t very helpful in knowing how this feat is accomplished. The probable answer is in the susceptibility of goslings (and other birds and even animals) to filial imprinting (from the German for "stamping in") during the first few hours after hatching. The parents wanting a lager family need only be the closest moving large object at the right time and the young goslings will follow them as their "imprint" parents. I imagine this could happen accidentally as a pair of geese swims past groups of goslings at the opportune time and have them added them to their family as they go by. Imprinting was popularized in the movie Fly Away Home (1996), based on the actual experiences of Bill Lishman, who in 1986 started training geese to follow his ultra light plane and succeeded in leading their migration in 1993. Research fostered around imprinting has led to related learning about the importance of very early experiences in the development of the brains and activities of animals in a wide range of activities affecting them throughout their lives, even to the “negative imprinting” in human siblings (raised together for at least 6 years) that makes sexual activity between them unthinkable for them. 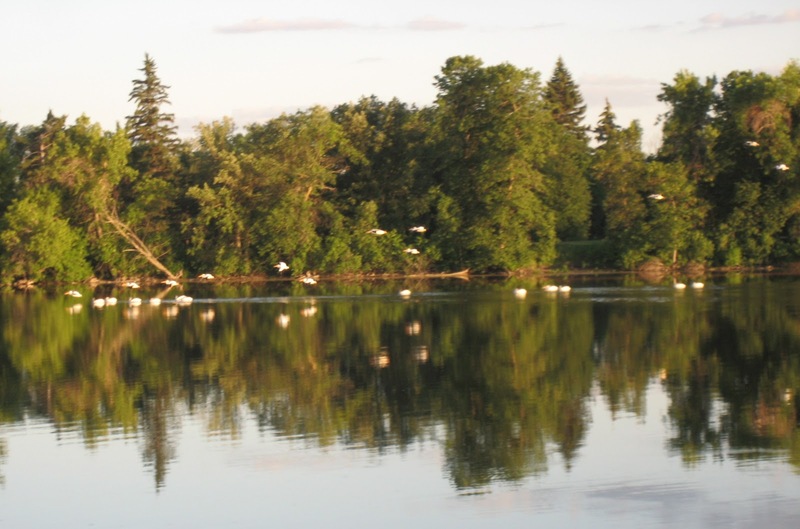 Most years we think it is a major event to see a few pelicans on Crescent Lake for a day or two in the summer. This year we have observed as many as 58 pelicans on the lake (actually an ox bow of the Assiniboine River) at one time. They staying day after day to feed in a group frenzy (presumably on the little fish accidentally pumped into the lake from the Assiniboine River). We have no idea why the sudden increase in their numbers here. In spite of a worrisome decrease in 2010 in the Mexico population of Monarch butterflies, there has been a breathtaking increase in the general butterfly population in western Canada in 2012. Their migration between Mexico and other countries is complicated by the fact that although the species migrates north and south every year (like birds) their life cycle dictates that no one individual completes the entire journey which is spread over a number of generations, The ones that return to overwinter in central Mexico are at least great-grandchildren of the one who had left that same 60 square miles but have never been there before themselves . The following diagram from Parks Canada may be helpful, but if it is still confusing take comfort in knowing you are not alone. The transfer of route information through the generations is unusual to say the least.